Wake Forest College was founded in 1834 on a plantation purchased from Dr. Calvin Jones. Located in northern Wake County, the 617 acres was in an area known as the Forest of Wake because of its abundant hardwoods. The 1820 main dwelling became the home of the College’s first president, Dr. Samuel Wait. It was later moved twice on the campus and eventually became a boarding house for students. In 1956, the structure was donated by the Southeastern Baptist Theological Seminary to the Wake Forest College Birthplace Society and moved to North Main Street. The new site, which had been the school’s first athletic field, was deeded to the Society by the trustees of Wake Forest College. Restored to its original appearance, the house was opened in 1979 as a museum and archives. The Society owns the Calvin Jones house, the collections, and the grounds and is responsible for the museum, archives, and gardens. The museum is open for tours every day but Saturday and Monday. 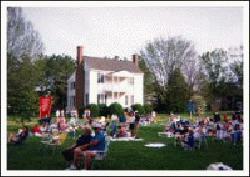 The grounds are available for concerts, weddings, and other events. The museum is open for touring each week Tuesday through Friday, 10:00 a.m. until noon and 1:30 until 4:30 p.m., and on Sunday, 3:00-5:00 p.m., except on public holidays. It is closed on Saturdays and Mondays. Tours can be arranged at other times by telephoning the museum. Allow between 30 and 60 minutes to see all the exhibits. Persons interested in doing research in the archives should telephone ahead to make an appointment. Hours of Operation: The museum is open for touring each week Tuesday through Friday, 10:00 a.m. until noon and 1:30 until 4:30 p.m., and on Sunday, 3:00-5:00 p.m., except on public holidays. It is closed on Saturdays and Mondays.